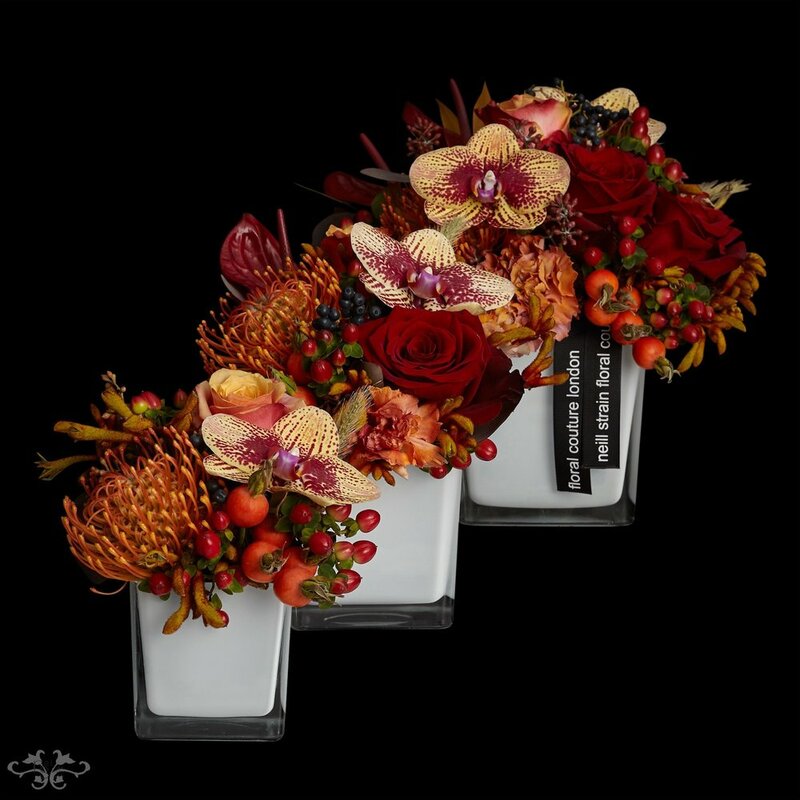 In Autumn, nature gives us an extraordinary display of beautiful colours and rich textures which Neill has captured in his new Autumn Collection 2017, available for ordering online with same day deliveries throughout central and greater London. 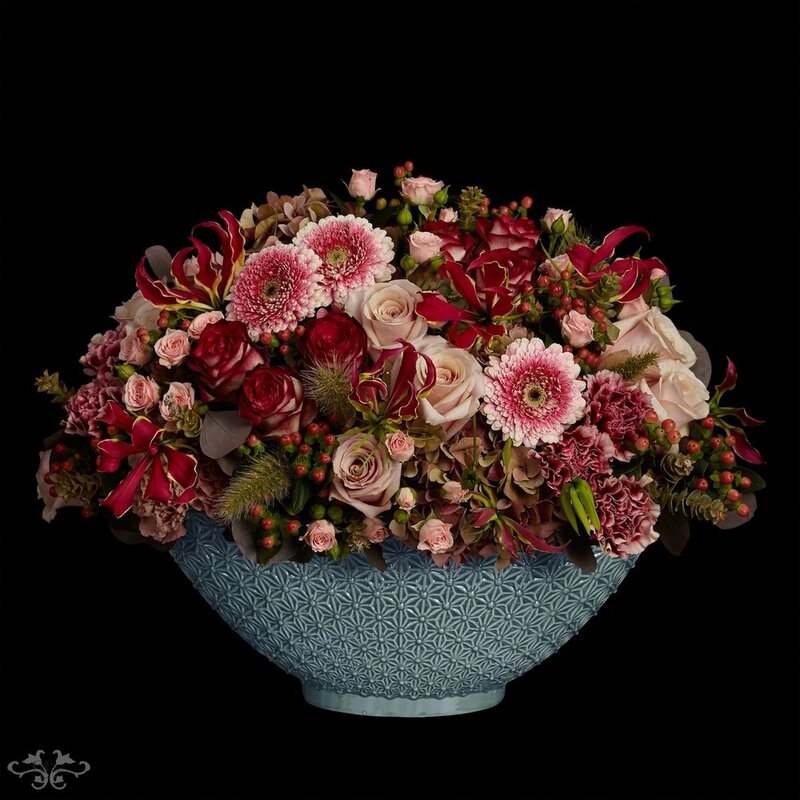 In this blog post Neill tells us more about these stunning designs and the exquisite flowers they are composed of. I adore the Autumn! 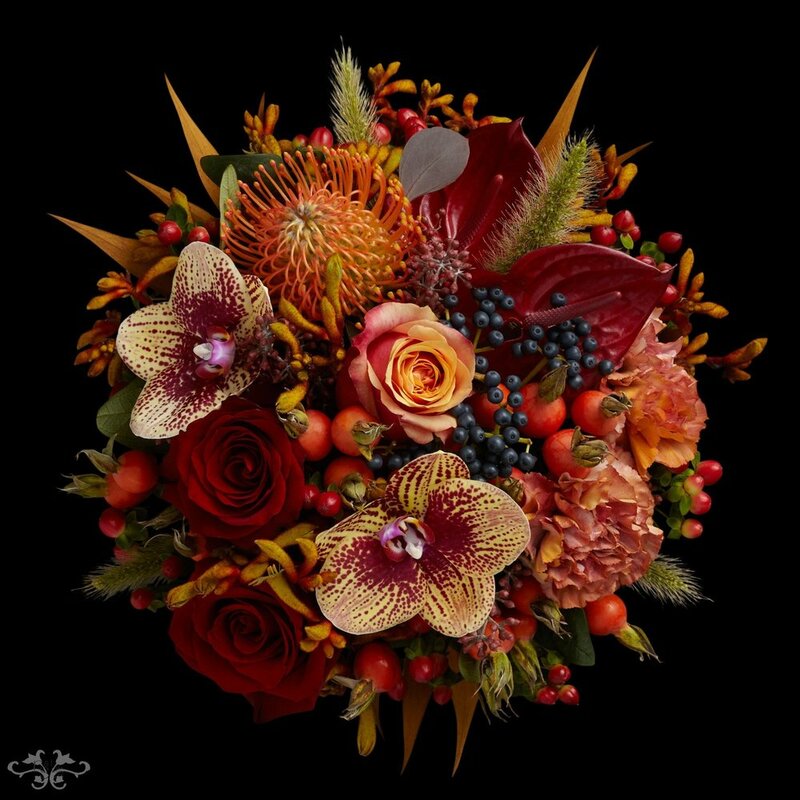 I adore the seasonal colours in the gardens and I absolutely adore the flowers I selected this year from our devoted Dutch growers for our new Autumn Collection 2017. We have created a really stunning range of designs, all of which can be ordered online, at our Belgravia boutique or our Harrods concession. 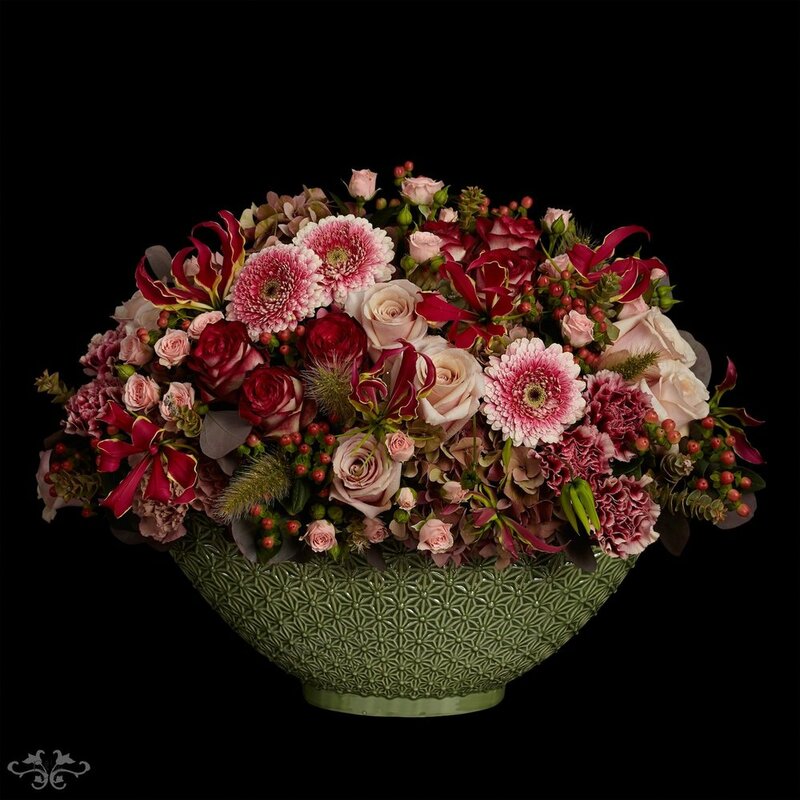 There are 5 new ranges, named after and inspired by some of the Squares and streets of Belgravia, and they each include hand-tied bouquets, both tall and low table arrangements and our popular Petite Couture arrangements. 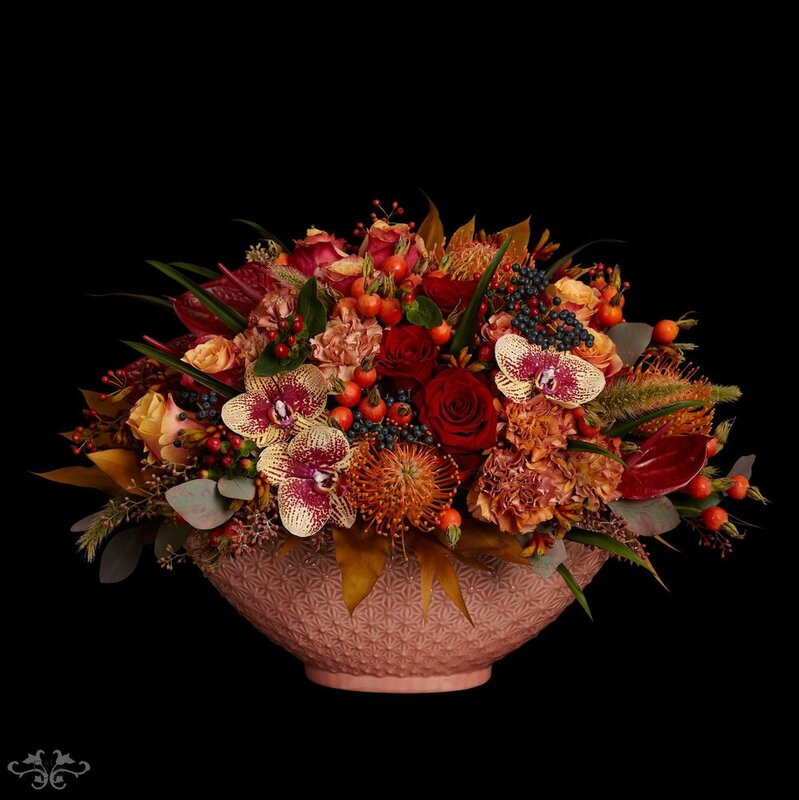 And with Halloween and Thanksgiving rapidly approaching, we have made our "Pumpkin Couture" - what could be more seasonal and more delightful than a Gourd filled with gorgeous Autumn flowers. 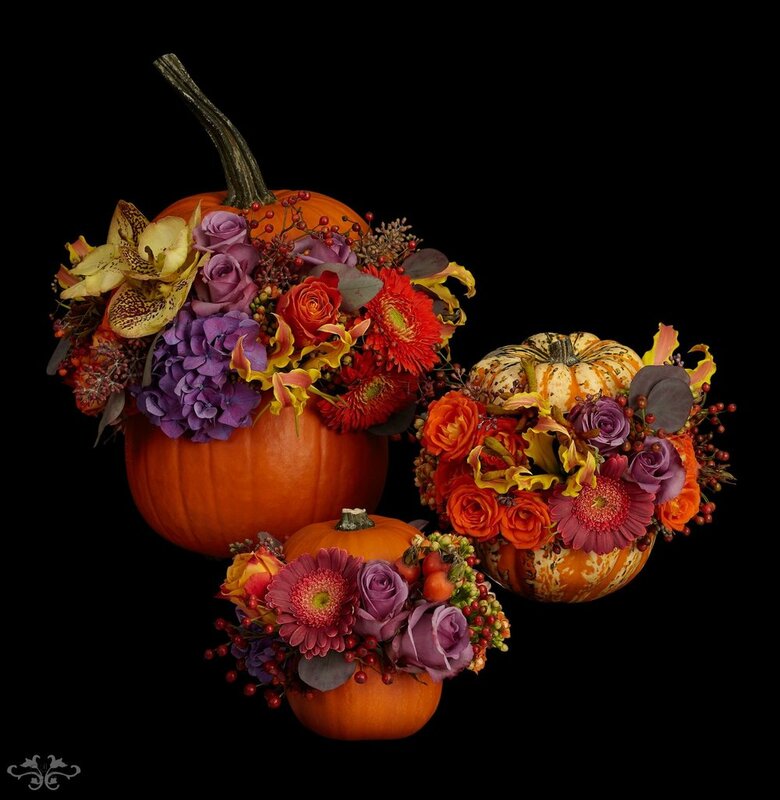 Pumpkin Couture arrangements are available in small, medium and large. In the most quintessentially Autumn colours is our Halkin range, named after West Halkin Street where our Belgravia boutique is located, a few doors away from the famous Mosimann's club. 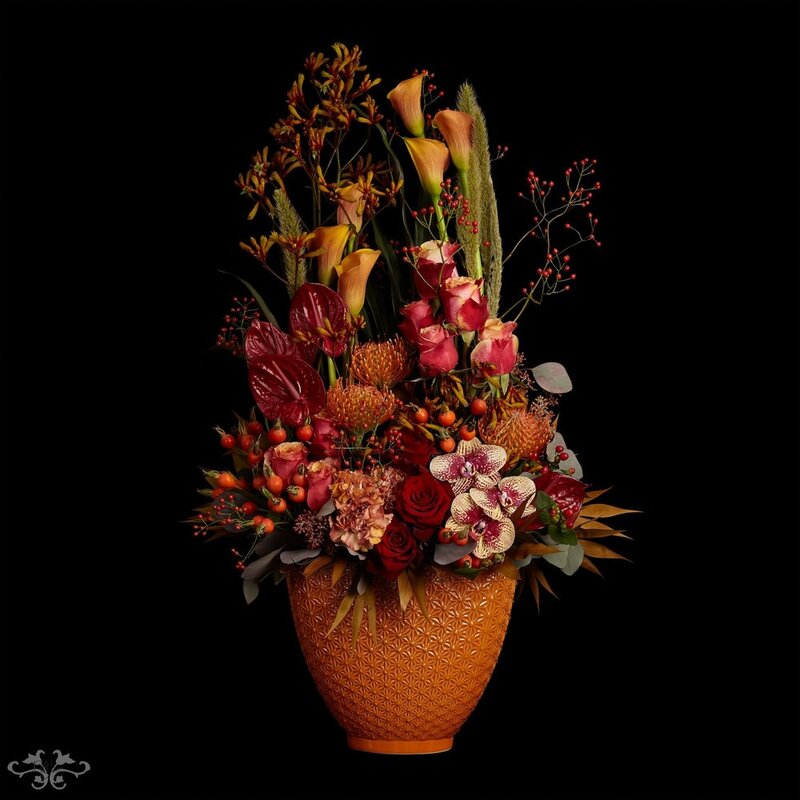 In deep shades of orange, coral, apricot and red we have a fabulous display of Roses, tropical Protea, Dianthus, Anthurium, seasonal berries, grasses and foliage topped with the exotic blooms of Phalaenopsis Orchids. 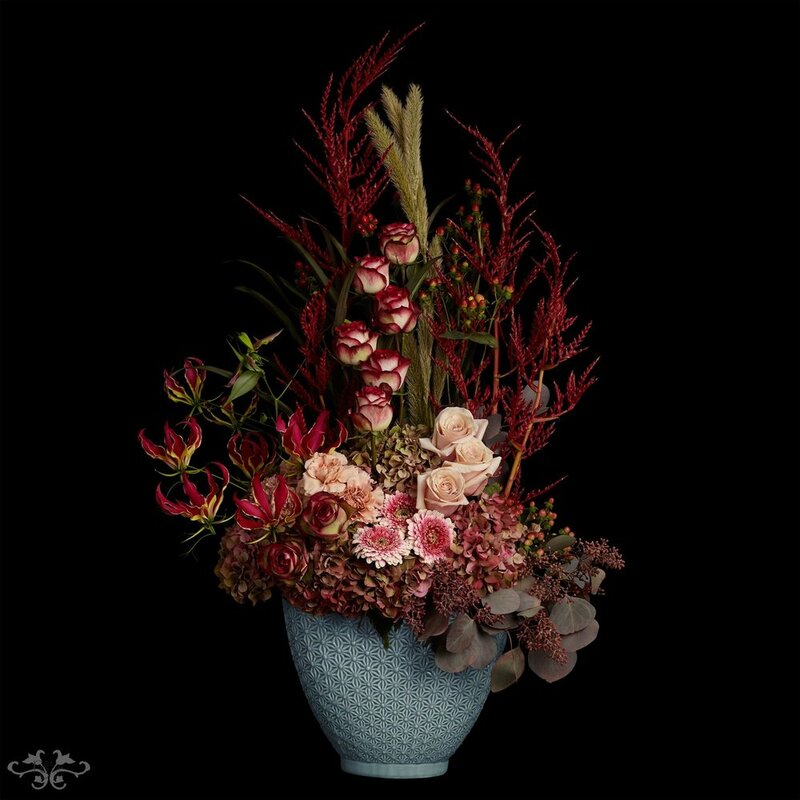 In the tall arrangement, we added long stems of Calla Lilies, Anigozanthus ("Kangaroo Paw") and trailing stems of Phalaenopsis with a choice of containers, either salmon pink or orange. Behind our Belgravia boutique is Motcomb Street, renowned for its elegant Georgian architecture, luxury boutiques and eating places, and recently re-opened as a pedestrian haven after extensive refurbishments by the Grosvenor Estate. 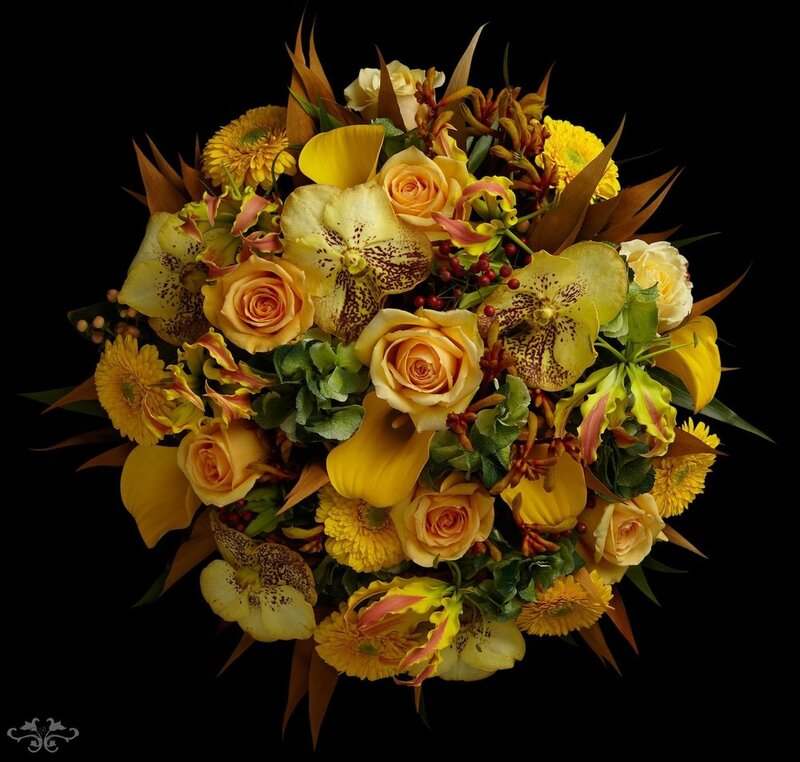 Our Motcomb range expresses the golden tints and tones of Autumn with Roses, Calla Lilies, Gerbera and green Hydrangea, amber hues of Anigozanthus ("Kangaroo Paw") and foliage, enriched with the exotic blooms of Gloriosa and Phalaenopsis Orchids. As elegant and luxurious as Motcomb Street itself. There are many shades to Autumn and one of my favourites is the pinky red tones found in some of the seasonal berries, fruits and foliages. The leafy Garden Square of the residential Lowndes Square, located at the foot of Motcomb Street just behind our Belgravia boutique, inspired me to create an exquisitely sophisticated range to bear its name. A new, not-yet-named red and pink Rose from our specialised grower, spray Roses, Gerbera, Dianthus and Hydrangea make the base of this range, with grasses, foliage and the flame-like blooms of Gloriosa Rothschildiana. 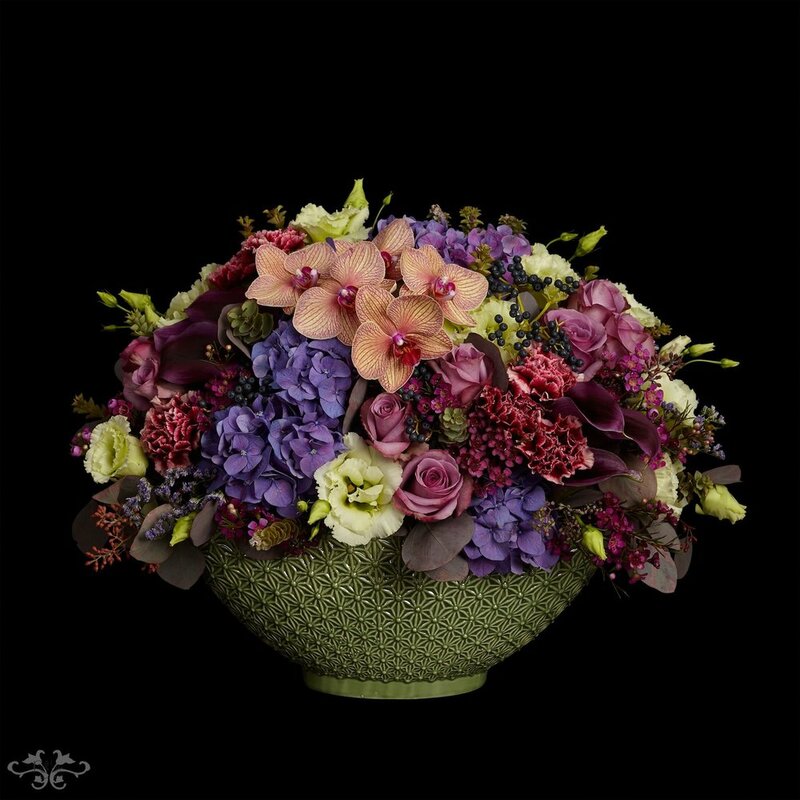 The tall and low table arrangements can be ordered with either a green or blue container. The iconic residential Garden Square and most sought after address in Belgravia is Eaton Square, built by the Grosvenor family in the 19th century with elegant terraces and white stucco facades. Inspired by this timeless elegance, our Eaton range bears a multitude of colours with a focus on blues, purple, pink and lime green. 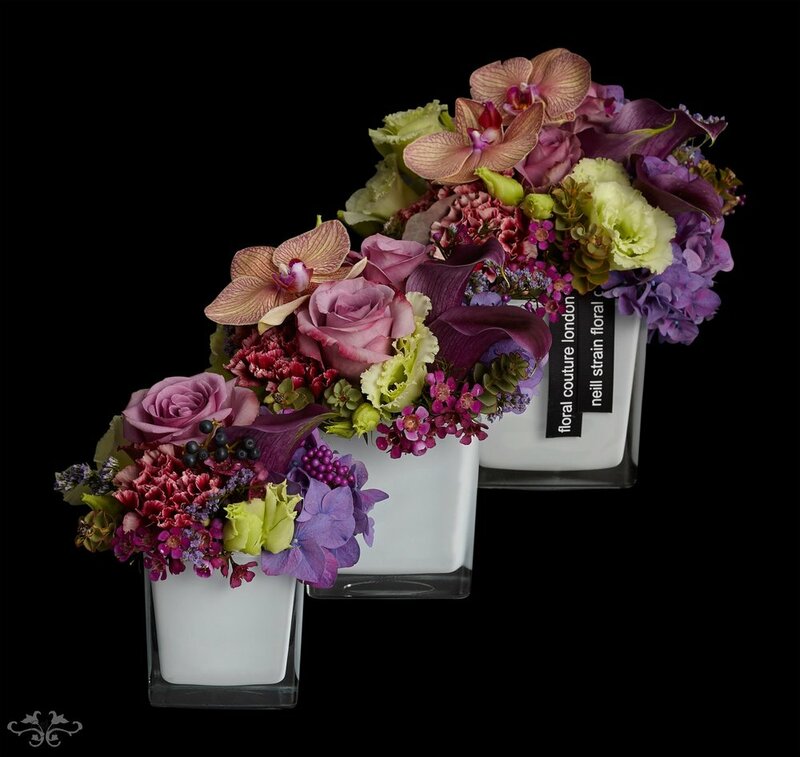 Roses, Calla Lilies, Hydrangea, Dianthus, a double Eustoma, berries and foliage are crowned with Phalaenopsis Orchids in the customary opulent style of our Floral Couture. The fifth new range for our Autumn Collection 2017 is created in the traditional white and green colour palette, honouring the magnificent green Garden Squares and white stucco facades of Belgravia after which it is named. 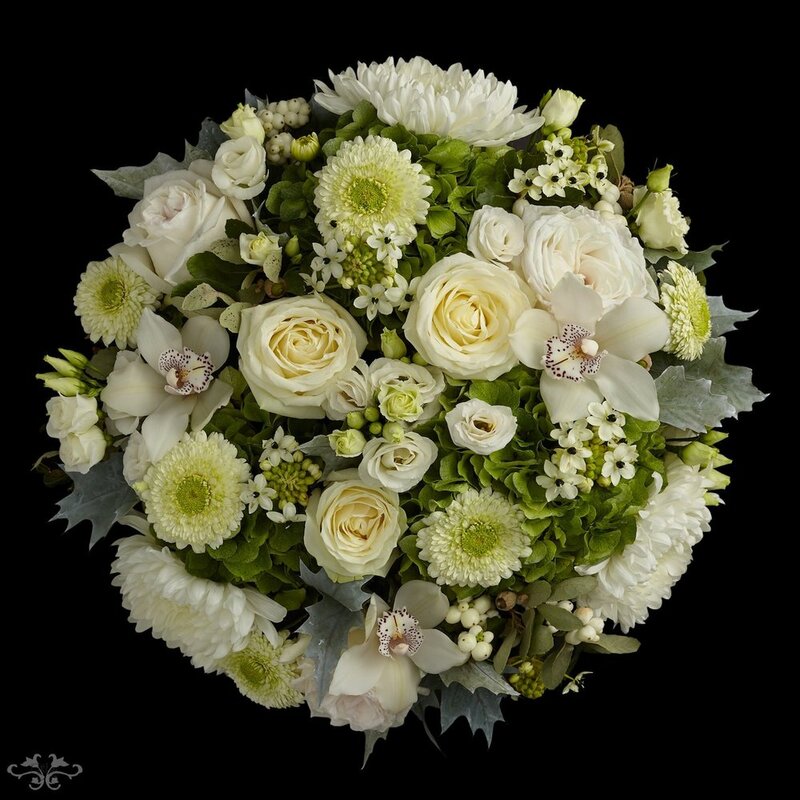 Large blooms of white Chrysanthemum, the traditional flower of Autumn, full white and cream Roses, Gerbera, Eustoma, Snow Berries and delicate Ornithogalum buds lie on a green Hydrangea base and are adorned with the translucent heads of Cymbidium Orchids. The infinite elegance and sophistication of this range epitomizes Belgravia, its architecture, its gardens and luxury living. I hope these designs have been inspiring for you, both to enjoy the natural beauty of the season and to bring that beauty into your home. 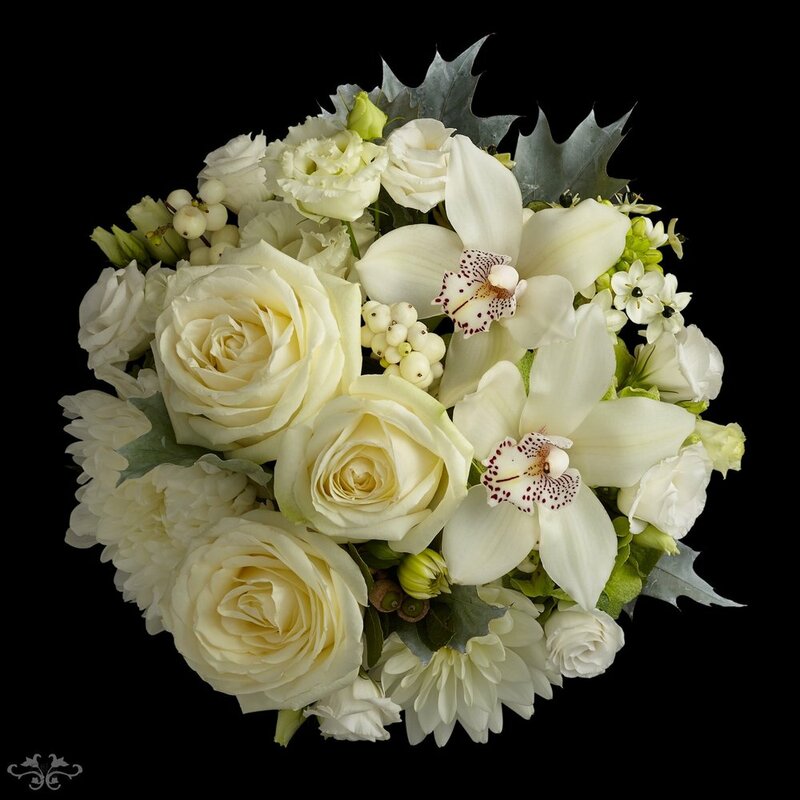 Our online ordering service (on our website) is very user-friendly and ordering your flowers could not be easier with same day delivery throughout London. However, if you prefer to pop into the boutique, or call us for a home styling appointment or to create something personalised, we will be delighted to help you. In the meantime, we're preparing for a festive Halloween so don't forget to come and take a look at our Pumpkin Couture!